A highly-anticipated rematch of the 2017 Mountain West Championship Game, Friday's game is being billed as the toughest matchup of the season - so far - for each team. BOISE — For the first time in 20 years, Boise State will be an underdog at home against a conference opponent when it hosts a surging Fresno State team at Albertsons Stadium Friday night. The Bulldogs (8-1, 5-0 Mountain West) enter the game ranked No. 16 in the AP Top 25, No. 17 in the Amway Coaches Poll and No. 23 in the College Football Playoff Rankings. A highly-anticipated rematch of the 2017 Mountain West Championship Game, Friday's game is being billed as the toughest matchup of the season - so far - for each team. And there is a lot at stake for both teams. The Bulldogs will likely need to win out if they hope to fulfill their dreams of reaching their first-ever New Years Six bowl game. And while a big-money bowl game is not out of the question for the Broncos, their path is somewhat more difficult and will require winning the rest of their games, in a slate that currently includes two ranked conference foes (Fresno State and Utah State). Fortunately for the Broncos, both of those games will take place on the blue turf of Albertsons Stadium, a place where the Boise State is 111-8 since 2000, the best home-winning percentage in college football during that span. Asked about the fact that the Bulldogs have never won in Boise, and whether the blue turf plays a role in the Broncos home record, Fresno State coach Jeff Tedford said at his weekly press conference that it's the team on the field, not the color of the field that presents a challenge to opponents. "I think their team is really good," Tedford said. "It's very loud there and it's a hostile environment and all that, but the color of the turf, I don't see that that makes a difference. "Boise has a great tradition at home," Tedford added. "And I'm not sure the turf has much to do with it. It's more about them being well-coached and having really good players." Despite the Broncos' home dominance, Fresno State boasts the nation's second-best scoring defense, and enters the game as 3-point favorites. The Bulldogs have blown out every Mountain West opponent so far this season, including a 48-3 win last week at UNLV. "One of the best [defenses] we've faced," Boise State offensive coordinator Zak Hill said of Fresno State. "They are experienced, they play off each other really well. We're gonna have to be dialed and detailed." Boise State coaches on Monday said that the home crowd could make all the difference on Friday night. "I know, to this point, they're the best team we have seen on film," defensive coordinator Andy Avalos said. "The home field advantage and having Bronco Nation behind us - we're going to need it." Added coach Bryan Harsin: "The way it was last game against BYU, the crowd, the energy, all those things matter. That made a difference in that game." Here is a list of Bronco Radio Network stations outside the Boise area. The game will stream live on the WatchESPN app, available in Apple and Android app stores. The service is only available to subscribers of participating cable and satellite television providers (including Cable One, Dish Network and DirecTV). KTVB's Bronco Roundup Game Day show will be live from Albertsons Stadium before the game from 6 - 7 p.m. on KTVB, KTVB.COM, and in the Bronco Roundup app. Join Jay Tust, Will Hall and Brian Holmes along with special guests on the Blue for a look at all of the major storylines surrounding this matchup. KTVB and the Boise State Alumni Association are giving away 2 tickets to each home game. Find the contest in the Bronco Roundup App or on the bottom left of the KTVB Facebook page. Winners will be drawn Thursdays before every home game so don’t forget to check your email! All Broncos fans attending the game are encouraged to wear blue. 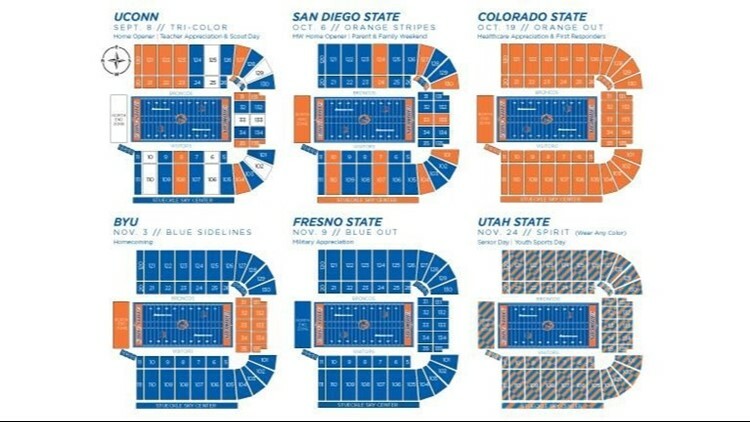 Color schemes for Boise State 2018 home football games. Boise State and Fresno State have faced each other a total of 20 times over the past 40 years, with the Broncos owning a 14-6 advantage in the all-time series. The teams met twice last year, splitting the results. The Bulldogs prevailed 28-17 in Fresno in the 2017 regular season finale, while the Broncos pulled off a close 17-14 win in Boise in the Mountain West Championship Game. The programs played just three times between 1977-2000, but have since played regularly as conference mates in the WAC and Mountain West. Since 2005, the winner of each contest claims the "Milk Can" trophy. The Boise State defense has been bit hard by the injury bug this season, and fans got more bad news on Monday when the team announced that linebacker Riley Whimpey suffered a season-ending ACL tear Saturday against BYU. Whimpey is the team's leading tackler with 55. The Broncos have lost three defensive starters for the season due to injury. In addition to Whimpey, they are also without safety Deandre Pirce and defensive tackle David Moa. But there was also some good news this week: starting nose tackle Sonatane Lui is expected to return to the lineup against Fresno State. Lui has been out since going down with a knee injury on Oct. 13 against Nevada. On the other side of the ball, offensive guard Eric Quevedo is also expected to return. KTVB and the Boise State Alumni Association are partnering again to present the Bronco Bash at the Alumni and Friends Center. This popular event is open to Broncos fans three hours prior to every home football game and closes 30 minutes prior to kickoff. The event features a family-friendly atmosphere with live music and activities for all ages. New this year is the Bronco Bash Cash Dash, a series of one-minute challenges, that guests can play to compete for time in the Mountain America Credit Union cash machine, Boise State merchandise and other prizes. Find out more about the Bronco Bash here. A map of Bronco Bash events outside Albertsons Stadium on game days this season. 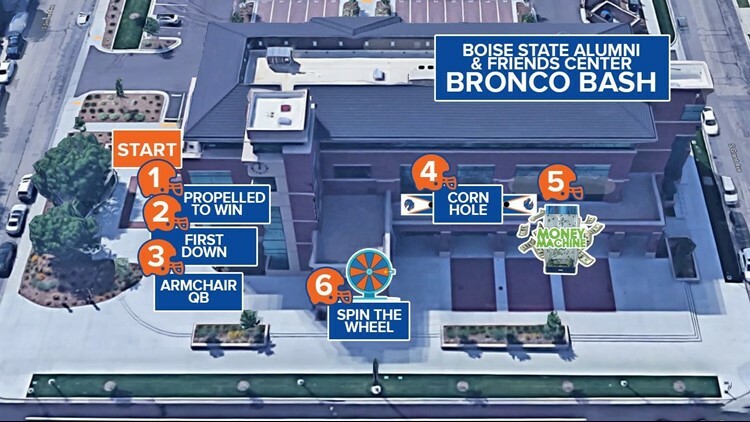 New this season, Boise State is unveiling an upgraded pregame tailgate experience for Broncos fans. The university is partnering with Blockparty, a fan-focused hospitality and entertainment company, to launch the Ford Tailgate Zone at DeChevrieux Field. The Tailgate Zone will include a Kids Zone, complete with a climbing wall and other entertainment geared toward the younger fans. It will also include huge televisions featuring top games, food trucks, and a "tailgate village" all on the Broncos' grass practice field adjacent to Albertsons Stadium. The tailgate party is free for fans, but if you want an upgraded experience with your own tent, TV and other amenities. VIP packages are available for purchase and cost between $400 and $2000. DeChevrieux Field opens for tailgating three hours before kickoff on home football game days. Here's a chance for you to high-five your favorite players and coaches as they walk to the football center for pre-game preparations. The "Bronco Walk" will start when the team leaves the Student Union Building about two and half hours before kickoff. The team will walk from the Student Union Building, through the Ford Tailgate Zone at DeChevrieux Field, past the Varsity Center, straight into the east stadium parking lot and ending at the Bleymaier Football Center. 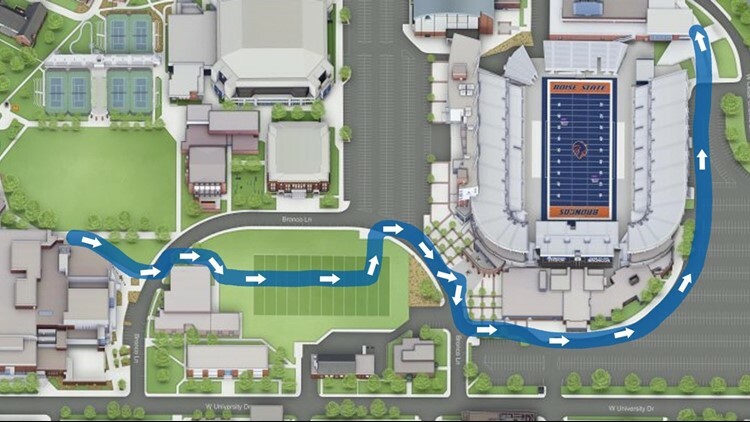 Map showing the route for the Bronco Walk before Boise State home football games. The 10 to 10 Zone remains in place for home games this season. It specifies areas off-campus where people age 21 or older may consume alcoholic beverages from 10 a.m. to 10 p.m. on Boise State home football game days only. Alcoholic beverages are allowed in opaque plastic cups within the zone. Glass containers, beer cans, and type of liquor bottle and cups with alcoholic labeling are not allowed. The "Zone" begins at Broadway Avenue and Myrtle Street, extends south down Broadway to Beacon, turns west along Beacon, north up Oakland Avenue, west on Potter Drive, north again up South Joyce Street, and then west along University Drive all the way to Capitol Boulevard. The boundary extends north along Capitol and turns east onto Cesar Chavez Lane, crosses Friendship Bridge north, and leads into Julia Davis Park. 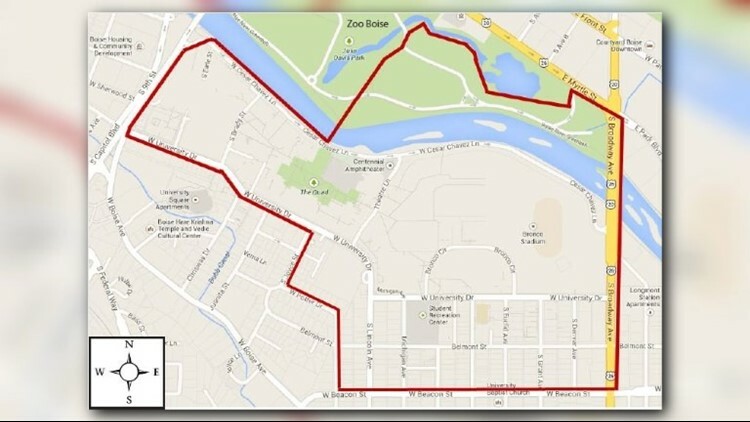 In the park, the "10 to 10 Zone" boundary is the area east of Zoo Boise to Broadway Avenue, and south of the Julia Davis pond. The 10 to 10 Zone specifies areas off-campus where people age 21 or older may consume alcoholic beverages from 10 a.m. to 10 p.m. on Boise State home football game days only. Bronco fans should arrive early. Those whose seats are not in the Stueckle Sky Center may enter the stadium through any gate. Fans are encouraged — but not required — to leave their bags at home or in the car. For faster entry into the stadium, bring a clear bag or no bag to the game. Prior to entry, fans will pass through metal detectors, and any bags carried in will be subject to search. Remember to leave prohibited items behind, including all weapons, alcohol, glass, and coolers. Expect increased traffic on all roads surrounding Boise State before and after the game. University Drive, from Capitol Boulevard to Broadway Avenue, will be congested throughout the morning and afternoon. Because of limited public parking on-campus, fans are encouraged to park off-campus and walk/bike or use a shuttle to get to the game. The Albertsons Stadium parking lot will open eight hours prior to game time on Saturdays and four hours prior to every game during weekdays. Boise State’s bike corral will be available near Christ Chapel on the corner of Broadway Avenue and Cesar Chavez Lane. Handicap accessible spaces will be available for a $10 fee in the West and East Stadium lots, the Engineering and Technology reserved lot and on the ground floor of the Lincoln Avenue Garage. Vehicles parked in accessible spaces must display an ADA license plate or placard and the placard/license plate registrant must be an occupant in the vehicle in order to purchase game day accessible parking. Parking is allowed in designated parking spots within Julia Davis Park, Ann Morrison Park, Riverside Park, and Kristin Armstrong Municipal Park. Parking for Boise State home games is free on a first come, first served basis. Towing will be delayed at those parks until 3 a.m. the following morning regardless of kickoff time. The Downtown Boise Association coordinates free shuttle buses from five convenient downtown locations to Bronco Stadium. These shuttles run every 15 minutes starting two hours prior to game time, and immediately after the game for one hour. Here is more information on the Bronco Gameday Shuttle, and game day parking options. Parking for home (weekend) games this season will also be available starting Saturday at the Civic Plaza complex, just east of the Ada County Courthouse. The cost is $5 per vehicle and proceeds will go to the FACES of Hope Victim Center. More than 600 spaces are available, and parking will be open at least three hours before kickoff. You can pre-pay online. To access the event parking area, follow Avenue A north, between Myrtle and Front Streets in front of the downtown Boise Winco store, directly into the Civic Plaza parking garage entrance. Patrons should be aware that NO alcoholic beverages or tailgating will be allowed in the Civic Plaza/Courthouse complex.